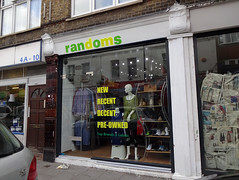 Clothes shop on Selsdon Road in South Croydon. It opened around the start of March 2019. By August 2012 it was a hairdressers called Hip Top Hair Studio photo, but this closed down some time between March 2017 and February 2018. As of February 2018 the interior was stripped out aside from a few bits of furniture photo. Still vacant as of February 2019 photo. Last edited 2019-03-29 13:10:10 (version 21; diff). List all versions. Page last edited 2019-03-29 13:10:10 (version 21).